Have you ever been asked to create a large-scale sales campaign, but NOT given the budget for delivering it into everyone’s hands? Or maybe, you own a small business and you wish there was a way to pool knowledge among other small business owners who share issues similar to yours. It is an often-overlooked tool, which businesses can readily use to bridge the gap in communicating between various audiences in many ways. It can provide an efficient, affordable and interactive means of content distribution. No more USB drives or CDs to deliver to your business’ many locations to kick off a training or launch your net sales campaign. Simply open a group from your personal profile. Set your visibility to “secret or closed.” Invite your members and get down to business. That’s all there is to it, and it’s FREE. Templates for thank you letters, apology letters, etc. Electronic tools, like calculators that show break-even, etc. Why not give it a try? It’s free, scalable and allows you to control whomever is invited. Content can quickly and easily be removed. And Facebook Groups allows participants to interact without the epense of meeting at a specific destination. What do you think? Could this be the location of your annual meeting this year? Or maybe it just organizes the details for that meeting. 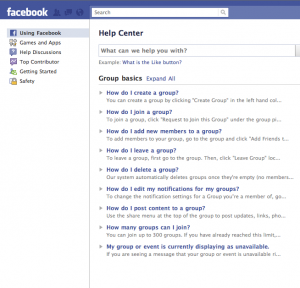 How could using Facebook groups help your business? Let me know if this was helpful, I’d love to hear from you. CALL US FOR YOUR INBOUND MARKETING & MARKETING TECHNOLOGY OPTIMIZATION NEEDS! Social Energizer’s purpose is to help companies develop lasting relationships with their customers and increase their conversion rates by adding proven online marketing techniques to their marketing mi.